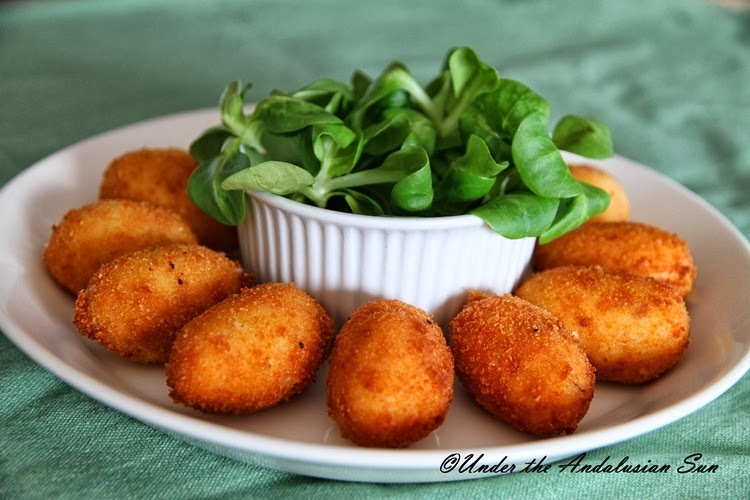 Under the Andalusian Sun food, wine and travel blog: Croquetas de jamón - simply the best! In all their simplicity croquetas are one of my all time favourite tapas. Perhaps one of my all time favourite foods. 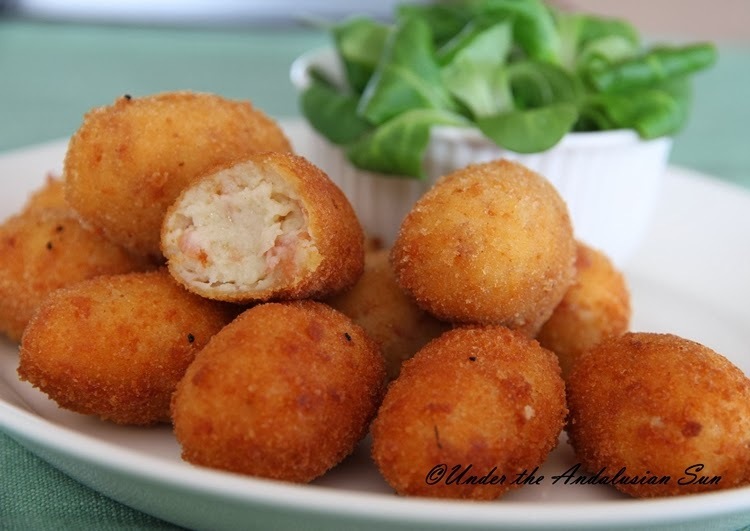 There's saltiness, crunch, ham... and deep-frying - what's not to like! And though you can use just about anything to stuff these, it's probably the very ham that makes the biggest treat. The Gentleman on the other hand loves croquetas I've put together using leftover mince. Personally I like frying the chopped ham first (no fat needed) to give it extra crispiness and bring out the toastiness that strenghtens the flavour of the ham. But you do as you see best. Making these is not difficult, but it does take some time: the bechamel sauce should be made a day in advance and kept in the fridge to help it set. If that takes too much patience, try to let it cool and set at least for a couple of hours. Deep-frying is easy too, as long as you get the hang of it. Oil is like... an angry woman. It's hot and all over the place, but you have to learn to listen to it. If it's too hot, the croquetas will burn on the outside and the insides start exploding all over the pan and the kitchen. If it's not hot enough, the croquetas will just float idly in the fat and won't get that crisp exterior. And with this one too there's the danger that the longer they sit there, boiling, the interior starts to seep out. It's best to make sure that the temperature is right before each batch. Another thing that should be remembered (when ever deep-frying anything) that they should be fried in (depending on the size of your pan) batches of few. In a crowded pan the oil will cool and ... well, the results are detailed in the previous sentences. If you make your own breadcrumbs using old bread (as I do), make sure that the crumbs you use for these are finely ground. This batch makes 24. During my calorie-conscious days I have tried to make just half a batch but I regretted it straight away. In a pan heat the oil and butter. As it has melted, add flour and stir vigorously for a couple of minutes until the flour and fat are completely incorporated. Add appr. 1 dl milk and crank the heat up until the mixture starts bubbling. Then add rest of the milk and keep stirring energetically until the mixture starts thickening - about 5-7 minutes. Turn the heat down and keep cooking so all the flour will cook. Keep stirring to prevent any lumps. Finally add the chopped ham and season. Be careful though as the ham is salty in itself. Cook for a little while longer and spread the mixture evenly on an lightly oiled dish. Let cool in the room temperature and then keep in the fridge until it has set, preferably the next day. Using a teaspoon take out dollops of the mixture and form them into little balls. Toss them carefully in the breadcrumbs, then in the beaten egg and then for second time in the breadcrumbs. The easiest way is the conveyor belt method: work in the batches of few croquetas breading them all, then dunking them in eggs and then breading them for the second time. After you're done with all croquetas, keep them in the fridge for at at least half an hour. AT this point you could also freeze them.